In an age of cyber technology and mass-produced molded products, it is rewarding to craft, with our own hands, a work of personal expression made from a natural material. The satisfaction derived from shaping wood with hand tools, making large chips fly with mallet and gouge, carefully rounding forms with a chisel, and applying a hand rubbed finish, is unique. Woodcarving can be enjoyed at any level, from whittling a found stick or pine board with a pocket knife to carving a sculpture in a fully equipped shop with many chisels and power tools. 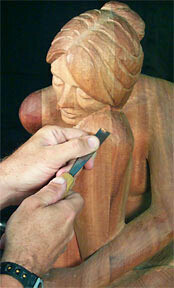 The following tutorial is a brief introduction to woodcarving. It will provide an overview of the carving process, including the common types of wood, the tools, some carving instruction, and tips on applying a finish. While an online tutorial cannot be exhaustive, I hope to provide enough information and encouragement to help a beginner pick up a chip carving knife and see how far his enthusiasm will lead. A list of the most common types of wood for carving. Commonly used tools for wood carving. A brief overview of wood carving techniques.